Educational Qualifications: (1) Must be a holder of minimum second class Post Graduate Degree in Mathematics or Applied Mathematics from a recognised University. And (2) Must be a holder of Bachelor of Education ( B.Ed.) degree in Science methods from a recognised University. 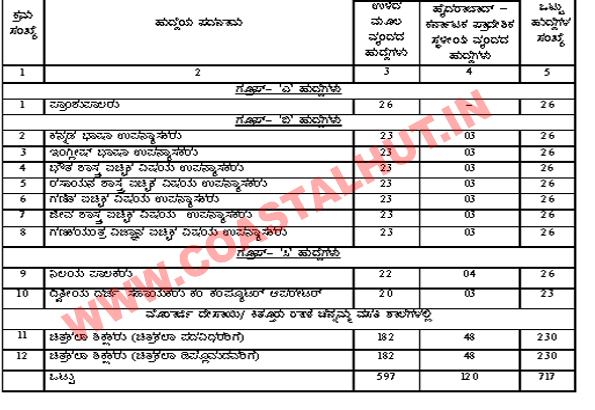 And (3)Must have studied Bachelor Degree and Post Graduate Degree in English medium only And (4) Candidates must have studied Kannada as one of the languages either in Bachelor Degree or Pre University Course or SSLC or holder of Diploma in Kannada or passed Kannada Certificate Course (Kava/Jana/Rathna) conducted by Karnataka Secondary Education Examination Board/ Kannada Sahitya Parishath , Bangalore.